Back in 2012, LinkedIn introduced the ability for people in your professional social network to endorse you for skills you may not even have known you had . 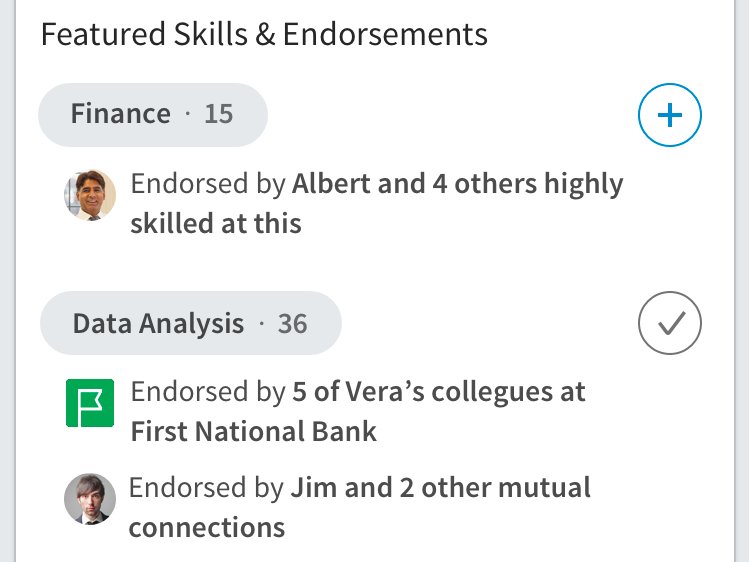 At first, LinkedIn endorsements seemed to many users more like a novelty than anything of value , since anybody you're connected to can endorse you for literally anything (at press time, I have 4 endorsements for "drinking coffee"). But LinkedIn says that endorsements are actually really key to helping people get noticed. People with 5 skills or more get 17 times the profile views and show up higher in LinkedIn search, the company says — very important for the company's vast audience of jobseekers . To make endorsements even more useful for everyone, LinkedIn today announces a big upgrade. Now, when you look at a LinkedIn profile, the first endorsements you'll see will be from coworkers and other mutual connections, so you know it's not just from a bunch of random strangers. "It really does matter who endorsed you," says Hari Srinivasan, Head of Identity Products at LinkedIn. An endorsement for project management by a mutual ex-boss might matter more to you than one from a potential job candidate's old high school chemistry teacher. LinkedIn is using its artificial intelligence mojo to try to always show you the most relevant endorsements from people you trust, for skills that matter to you. Along those lines, Srinivasan says, you'll start seeing more prompts to endorse people you're more closely linked to in the network and share skills with, versus random friends. If you have a skill in writing Java code, and a former coworker has a skill in writing Java code, you'll get the prompt to endorse her. The end result is a smarter system for endorsements that makes sure people always look their best to the viewers watching. Given that LinkedIn, and soon-to-be corporate parent Microsoft , are pushing LinkedIn as a tool for helping people maximize their economic opportunity and find better jobs, it's an important step. On a final note, LinkedIn is continuing to push an ever-growing list of recommended skills to make it easier for colleagues past and present to endorse you, but it has no plans to police what a valid skill may or may not be, especially given how fast the world is changing. In other words, my endorsements for "drinking coffee" will stand. "In the right context, that's a valuable skill," Srinivasan says.